•a community project that the participants themselves will plan and run over a 14-week period. During the course the participants get to meet and be inspired by pre-eminent Aboriginal leaders. On completion they receive a certificate II in Leadership Development. The program is run by the Challenger Institute and funded by the WA Department for Communities. For more information go to http://www.communities.wa.gov.au/Youth/programs/osmp/Pages/default.aspx. Applications close on 22 March 2013. 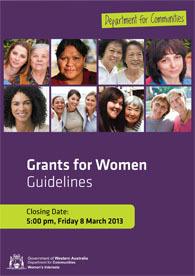 The Department of Communities is currently seeking applications for its ‘Grants for Women’ program 2013. The program will provide grants of up to $5,000 to eligible groups and organisations which seek to strengthen the health and wellbeing, economic security, leadership and safety of women in both the home and community. Click here for guidelines and eligibility requirements, and visit the Department of Communities Website to access an application form. Applications for 2013 will close 5:00pm on Friday, 8 March 2013. Nominations are now open for the Department of Communities’ One Sky, Many Paths Indigenous leadership program. • a community project which participants will be responsible for creating, developing and implementing over a ten week period. The training is accredited and conducted by Challenger Institute of Technology and participants will have a local mentor to help with their community project. The residential weeks for young men are in May and August, and for young women in September and November. For more information and to download the nomination form go to www.youth.wa.gov.au. Participants will need someone to nominate them, a family member, community leader or elder and all applicants have to be Aboriginal or Torres Strait Islander living in Western Australia and aged between 18 and 25 years. The deadline to apply is 2nd May 2011.